This film is the first time that acting icon Denzel Washington has acted in a sequel. This sequel, like most sequels, wasn't as good as the preceding film. It was still enjoyable, just predictable. And when it wasn't predictable it was confusing. I think this was a function of the writing. If you intend to make someone's demise look like something that is unrelated to their family or work do you then subsequently attempt to murder their relatives or co-workers? No. You don't do that because even the slowest bear in the woods will realize that the previous incident was no accident. There are a few other head scratching moments like that throughout the film but as with most good action films the viewer can ignore these. 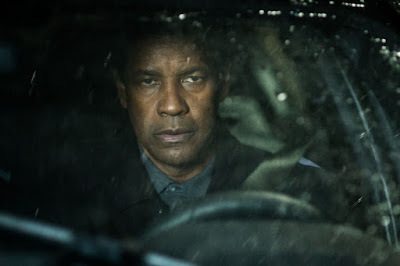 This film has to do more heavy lifting than the first insofar as in the first movie, the viewer is surprised to see Denzel set his stopwatch to test his reflexes and skills before badly injuring or killing people who have chosen to harm innocents. In this movie all of that is already expected. It's baked into the cake. The director uses that technique a few times just to remind people of what a bada$$ Robert McCall (Denzel Washington) is, but much of the film is really a detective movie. There weren't many surprises. Any semi-intelligent viewer will almost immediately identify the bad guys and their purpose. The movie's question is not really who is the bad guy but rather what makes someone a bad guy. McCall has a very violent past as someone who apparently worked for multiple organizations that were and are part of the military-industrial complex. When God wanted to send a message, He sent an Angel. When the U.S. government wanted to send a message, it sent McCall. In either instance, death and destruction are sure to follow. After his wife's death McCall appears to be looking for atonement if not salvation. But McCall still judiciously uses his very particular set of skills by standing up for those who can't stand up for themselves. Most people who knew McCall from his previous life think he's dead. McCall lives a monastic life as a Lyft driver in Boston, reading classic books and correcting wrongs. The film examines McCall's relationship with an elderly Holocaust survivor who's pursuing a quixotic plan to recover some allegedly stolen art before he dies. 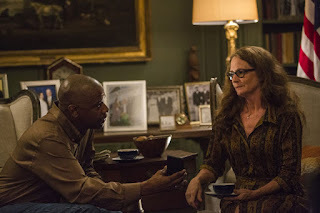 McCall's only real friends are his former handler and CIA analyst Susan Plummer (Melissa Leo) and to a lesser extent Susan's hapless writer husband Brian (Bill Pullman). 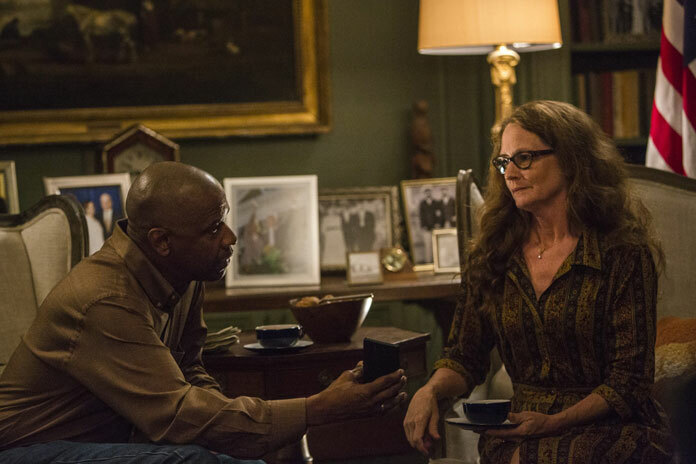 Susan provides the connections and relevant intelligence material which the officially dead McCall can't get on his own. McCall shows tough love to Miles Whittaker,an artistically gifted neighborhood youth (Ashton Sanders), who could follow his dreams of art or lose himself in nihilistic street activities. When Susan is tasked to investigate the death of an Agency asset in Brussels, unpleasantness from the past resurfaces to invade McCall's world. Washington's only concession to age (he's 63) appear to be some minor facial lines and puffiness. Washington is still believable as someone who effortlessly employs a mix of different martial arts -most of which seem to be centered around Krav Maga- to put a world of hurt on those who would harm him or his. 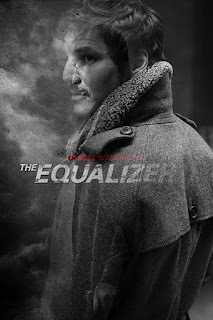 Pedro Pascal makes an appearance as an intelligence asset who can help. This was a decent, not great movie with a hero who is just as concerned as saving the next generation as he is in righting wrongs or taking vengeance. There are death before dishonor speeches, bada$$ oneliners, and a few Cosbyesque "Pull up your damn pants you punks!" rants aimed at the younger black generation. The first movie was great. This one isn't. It was still plenty of fun though. Washington conveys intensity, confidence, purpose, and righteousness like few other actors can. That's the real draw of The Equalizer 2. This was a fun summer flick. If that's what you're looking for have at it. The violence takes a while to arrive but when it does it hits like a northbound train.